Oilers captain Nathan Lutz battles Mallards forward Jeff Lee on Wednesday night. 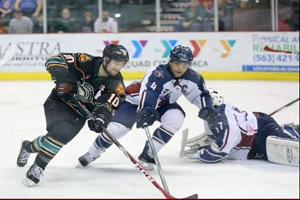 On Tuesday and Wednesday night the Tulsa Oilers ended their longest road trip of the season with a 6-3 loss to the Missouri Mavericks and a 2-0 shutout of the Quad City Mallards. Missouri has been a consistent thorn in the side of the Oilers since they became a team back in 2009. In 53 games against the Mavericks the Oilers have only won 14 times, and that number did not increase when the two teams met in Independence on Tuesday night. Adam Pleskach scored twice and TJ Caig netted a single goal, but the Mavericks doubled the Oilers efforts to notch the win. All time the Oilers are now 14-35-4 against the Mavericks and as a result of the regulation loss fell to 27-25-4 as of the final horn on Tuesday night. One of the more glaring stats in Tuesdays game was that during their recent five-game win streak, the Oilers allowed only 12 goals in five games but have now given up 12 goals in the last two contests. Missouri has scored four goals or more in six of the eight meetings against Tulsa this season. The other statistic in the game that reflected bad on Tulsa was that the Mavericks scored five goals on their first 17 shots of the contest. On Wednesday night, a superhuman effort by Oilers goalie Kevin Carr lifted his team to a 2-0 blanking of the Quad City Mallards in the final game of the season long road trip. Carr made a perfect 31 saves on 31 shots in the game which saw TJ Caig and Jeff Jubinville score goals in the first and second period, and the Oilers defense clamp down and defeat ever offensive effort posed by the Mallards for the entire 60-minutes to earn the win. Tulsa snapped a brief two-game skid and finished its three-week trek through the Central Division with a 6-2-0 record. Kevin Carr earned his third shutout on the season and through the brutal eight-game road trip that ran from Canada to Illinois the Oilers posted a 6-2-0 record earning 12 crucial standings points. The Oilers as of the end of the game on Wednesday night have a 28-25-4 record which is good enough for sole possession of third place in the ECHL Central Division with 60 points. The next game for the Oilers is the first of a three game set when they take on the Wichita Thunder next Friday night (3/13). After that, the Oilers will host the Brampton Beast in a pair of games on the 14th and 15th. This entry was posted in Sports on March 6, 2015 by admin.